Street art had been sweeping the world for years, and artists like Shepard Fairey and their highly regarded creations in Wynwood Walls have revitalized this community stretching from the 25th to 26th streets complex of six separate buildings in Miami. 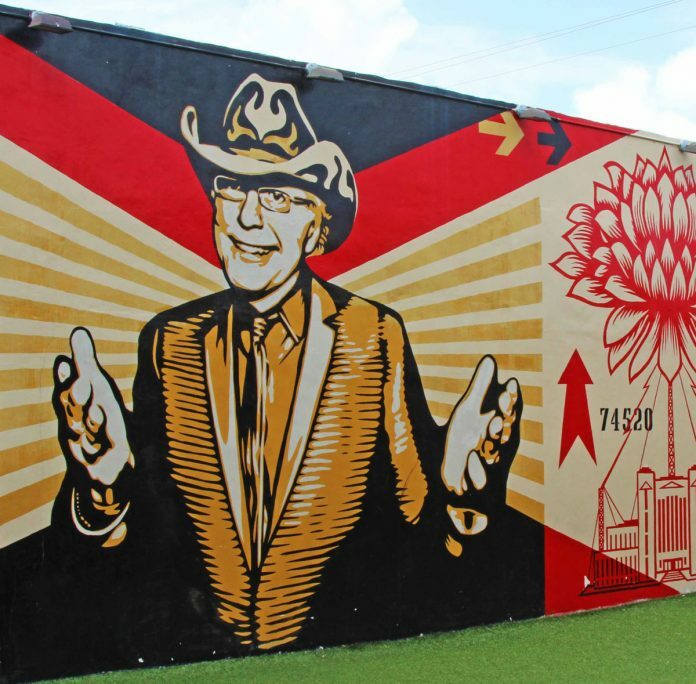 The story of Shepard Fairey’s monumental mural can’t be told without the back story of Wynwood Walls developer Tony Goldman. When he first saw the Wynwood neighborhood, Goldman saw beyond the blighted warehouses and gritty streets. He saw canvases for huge murals, a stark change from the architecturally historic neighborhoods he had been developing since the 1980s starting with Soho in NYC and then Miami Beach’s Art Deco District in the late 80s and 90s. Street art had been sweeping the world for years, with artists taking over blank walls in urban areas and filling them with images that spoke to the neighborhood. Goldmans vision was to carve out a group of warehouses, anchor them around a courtyard and fill them with murals, galleries, parks and eateries, a gathering place for creatives. One of the first artists to be invited to design a mural for the courtyard was Shepard Fairey, whose Obey Giant street art had evolved into a worldwide phenomenon. Fairey’s original mural, a prominent wall facing 2nd Avenue in the Wynwood Walls main courtyard finished in 2010, was initially filled with women and gently politically-charged images about “peace and harmony” Fairey said. The new mural, created in 2012 is all about “celebration and inspiration.” The key figure is developer Tony Goldman with his welcoming arms stretched wide and a stylish cowboy hat planted firmly on his head. Goldman passed away in 2012 and the mural was unveiled during Art Week in Miami. Watch: “Here Comes The Neighborhood” and explore the power of Public Art and innovation to uplift and revitalize urban communities. Shepard Fairey Mural at Wynwood Walls took five days to complete and features at its center an image based on a photograph of Tony Goldman taken by Miami photographer Serg Alexander. It also features Jean Michel Basquiat, a pivotal art world figure who emerged in Soho in the 80s at the time Goldman was helping develop the neighborhood. The Dalai Lama, Jimi Hendrix, Martin Luther King, Miles Davis, David Bowie, flowers, targets and the Obey Giant logo roll across the mural as touchstones of thought and inspiration. Goldman was born to a single mother and was adopted at birth, then raised on the upper east side of NYC. He had a keen interest in art but after school, he worked for his uncle who had a real estate business. By 1968, he started his own real estate company, Goldman Properties. Goldman was the central person in South Beach’s renaissance, realizing the neglected little Art Deco hotels were candy colored diamonds in the rough. He scooped up one a month for 18 months straight and created a flourishing community for design, art and the city. The Goldman family also puts great emphasis on a neighborhood’s walkability, meaning that the building don’t overwhelm the street. At Wynwood Walls, life-sized murals and colorful drawings from the world’s greatest artists working the street art genre are featured and constantly rotating. One big difference in the Wynwood Walls murals is that they are curated and protected on private property. They are accessible to the public, but also visible from the street. Fairey’s street art is usually short-lived, a natural end game for renegade art, but this mural, like the neighborhood, has staying power. “Tony was really thinking about how art can benefit people’s city experience and how that can be sanctioned by the city rather than it having to be done in opposition to the city. I like that because I see art as a really important part of people’s quality of life,” Fairey said. 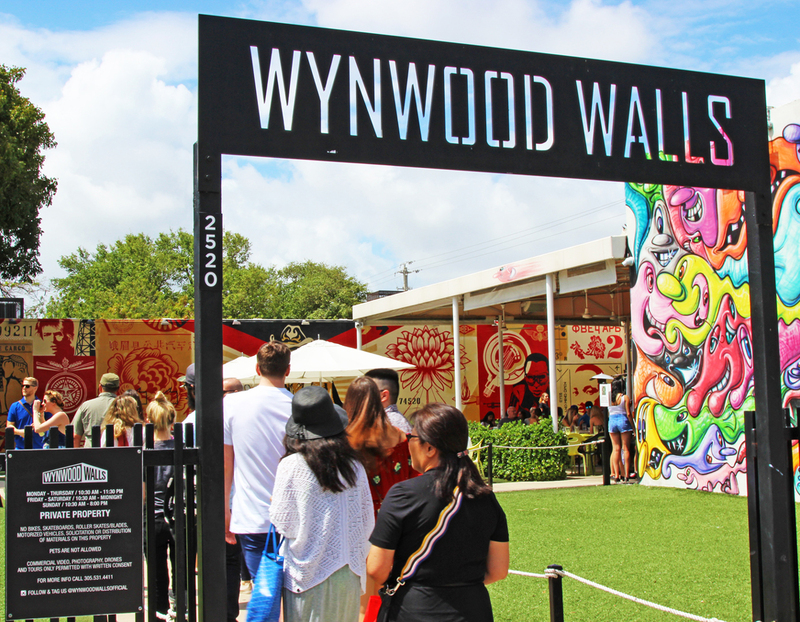 In addition, Shepard designed the logo and indoor walls and uniforms for the sprawling Wynwood Restaurant and Bar during the second year of the Wynwood Walls. The restaurant has separate areas for more formal indoor dining, a lively bar area and a large outdoor eating area that sits in the middle of the first courtyard, a prime spot for people and mural watching. Due the nature of impermanence of street art, I ask Jessica if she thinks the mural of her father will always be there. Learn about the Shepard Fairey Mural at Wynwood Walls that has provided to many visitors peace and harmony” and it is a source of celebration & inspiration.